As I did this fanart as a portrait size, it is difficult to make it into a wall. So i extend the side of the drawing. This is my early christmas gift to all. I hope you enjoy this holiday season. My inspiration for this art is christmas. 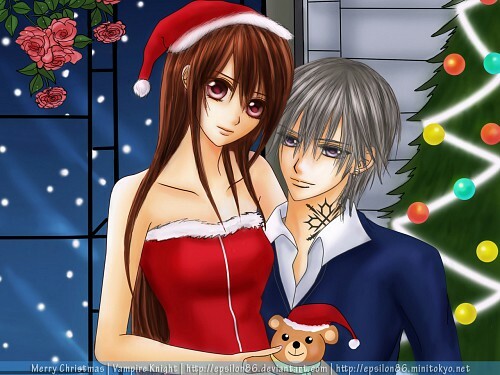 I like to dress Yuki as a Santa claus for Zero. This art took me 2 days to make. i know it hasn't come yet..
One more thing, Who do you think Yuuki falling in love with? I'm a YukixKaname fan but your wallpaper is very beautiful! I am also a YukixKaname fan, but i like your wallpaper. If you would make one with yuki and Kaname, it would be great. Great X-Mas Wallie! Love the Yuki x Zero pair ? Arigatou for this special wall, it is one of the best surprises of this Christmas! ? is there an kaname ver. of this? i like it, i like it! very well done! very cute ^_^ love that . Very cute wall. Im a YukixZero fan, and i like this wall alot. Thanks for making this! Awww this is so cuttteeeee *O* thanks!